Objectives We investigated whether citrullinated tenascin-C (cTNC), an extracellular matrix protein expressed at high levels in the joints of patients with rheumatoid arthritis (RA), is a target for the autoantibodies in RA. Methods Citrullinated sites were mapped by mass spectrometry in the fibrinogen-like globe (FBG) domain of tenascin-C treated with peptidylarginine deiminases (PAD) 2 and 4. Antibodies to cyclic peptides containing citrullinated sites were screened in sera from patients with RA by ELISA. Potential cross-reactivity with well-established anticitrullinated protein antibody (ACPA) epitopes was tested by inhibition assays. The autoantibody response to one immunodominant cTNC peptide was then analysed in 101 pre-RA sera (median 7 years before onset) and two large independent RA cohorts. Results Nine arginine residues within FBG were citrullinated by PAD2 and PAD4. Two immunodominant peptides cTNC1 (VFLRRKNG-cit-ENFYQNW) and cTNC5 (EHSIQFAEMKL-cit-PSNF-cit-NLEG-cit-cit-KR) were identified. Antibodies to both showed limited cross-reactivity with ACPA epitopes from α-enolase, vimentin and fibrinogen, and no reactivity with citrullinated fibrinogen peptides sharing sequence homology with FBG. cTNC5 antibodies were detected in 18% of pre-RA sera, and in 47% of 1985 Swedish patients with RA and 51% of 287 North American patients with RA. The specificity was 98% compared with 160 healthy controls and 330 patients with osteoarthritis. Conclusions There are multiple citrullination sites in the FBG domain of tenascin-C. Among these, one epitope is recognised by autoantibodies that are detected years before disease onset, and which may serve as a useful biomarker to identify ACPA-positive patients with high sensitivity and specificity in established disease. Tenascin-C can be found in immune complexes in the RA joint.30 Moreover, a citrullinated peptide from the FBG domain of tenascin-C was recently detected in RA synovial fluid.31 These data prompted us to investigate this arginine-rich domain of tenascin-C as a novel autoantigen. To characterise it with the criteria that have been applied to cFib, cVim and CEP-1, we epitope-mapped the FBG domain with a screening panel of RA sera, and examined the antigen specificity of two immunodominant epitopes by inhibition studies. We then went on to standardise an ELISA assay and used it to detect antibodies in pre-RA serum samples and two large independent patient cohorts with early and established RA. Recombinant human FBG26 was incubated with rabbit skeletal muscle PAD2 (rPAD2), or recombinant human PAD2 or PAD4 (hPAD2, hPAD4), resolved on an SDS gel and stained with Coomassie-blue or western blotted with a monoclonal human antimodified citrulline (AMC) antibody (Modiquest Research, clone C4, 1:500). A detailed description of this method can be found in the online supplementary file. Citrullinated FBG was resolved on a 12% SDS gel and Coomassie-stained protein bands were excised and in gel-digestion performed as described.36 Peptides were analysed by LC-MS/MS. Details of this method can be found in the online supplementary file. Details can be found in the online supplementary file. Details about peptides can be found in the online supplementary file. ELISAs were used to detect antibodies against citrullinated peptides in human sera as described.13 Briefly, 96-well plates were coated with 10 μg/mL peptide, blocked with 2% BSA and incubated with sera diluted 1:100. Bound antibodies were detected with an HRP conjugated antihuman IgGFc monoclonal antibody (Jackson—for EIRA study, Stratech—for all other ELISAs). A standard curve of positive sera was used to calculate relative antibody titres in arbitrary units (AU) for each sample. Subtraction of the OD450 of the native peptide from the OD450 of the citrullinated peptide was used to correct reactivity and dOD450 values were transformed into AU using the standard curve (dAU). The cross-reactivity assay is described in the online supplementary file. FBG was citrullinated by rPAD2, demonstrated by a small increase in the molecular weight on Coomassie-stained SDS-PAGE and western blotting with an AMC antibody (figure 1A,B). Mass spectrometry analysis of citrullinated FBG covered 14 of the 17 arginines present in this domain of tenascin-C, of which 9 were citrullinated (figure 1C, see online supplementary figure S1). rPAD2, hPAD2 and hPAD4 each citrullinated the same sites within FBG with no major difference in the degree of citrullination observed (see online supplementary figure S2). Circular dichroism showed comparable spectra between native FBG and citrullinated FBG (figure 1D) indicating that citrullination of FBG does not impact the secondary structure of the protein. Differential scanning fluorimetry however revealed a significantly lower melting temperature of citrullinated FBG (46.5±0.2) compared with FBG (54.3±0.1) (figure 1E), demonstrating that citrullination leads to partial protein unfolding. Citrullination of fibrinogen-like globe (FBG) by rPAD2. Coomassie stained SDS gels (A) and immunoblot probed with an antimodified citrulline (AMC) antibody (B) of FBG citrullinated by rPAD2. FBG incubated in buffer with rPAD2 but without Calcium (-Ca2+) or without enzyme (-PAD) served as negative controls. Untreated native FBG was loaded in the last well. (C) Arginine residues citrullinated by rPAD2, hPAD2 and hPAD4 were determined by LC-MS/MS. Arginine residues that were modified to citrulline are highlighted in blue, all non-citrullinated arginines are shown in green. (D) The super secondary structure of native and citrullinated FBG (3 h, 20U rPAD2/mg FBG) was analysed by circular dichroism. (E) The melting temperature of native and citrullinated FBG (3 h, 20U rPAD2/mg FBG) was analysed by differential scanning fluorimetry. Results are shown as mean ±SD from three independent experiments. Five tenascin-C cyclic peptides encompassing the citrullinated residues identified by mass-spectrometry, together with their arginine-containing controls (see online supplementary table S1), were used to map antibody response in a screening panel of serum samples from 20 patients with RA, and from 20 healthy subjects, by ELISA. Antibodies to citrullinated tenascin-C (cTNC) peptides cTNC1 and cTNC5 were detected in serum samples from 35% and 40% of patients, respectively, but not in control sera, with no response against the arginine-containing control peptides (rTNC). There was little or no reactivity with the other three peptides tested (figure 2). Therefore cTNC1 and cTNC5 were selected for further study. Identifying the citrullinated antibody epitope. IgG response to citrullinated fibrinogen-like globe (FBG) peptides (cTNC) and arginine containing control peptides (rTNC) in patients with rheumatoid arthritis (RA; n=20) and healthy controls (HC, n=20). Mann-Whitney U test was used to calculate p values for differences between groups (ns=no significant difference, *p<0.05 and **p<0.01, ***p<0.001, ****p<0.001). cTNC, citrullinated tenascin-C.
To examine epitope specificity and potential cross-reactivity of anti-cTNC antibodies with already identified ACPA antigens, inhibition experiments were performed with the well defined peptides of CEP-1 (5KIHA-cit-EIFDS-cit-GNPTVE21), cVIM (59VYAT-cit-SSAV-cit-L-cit-SSVP74) and cFIBβ (36NEEGFFSA-cit-GHRPLDKK52). Absorption by the homologous peptides was more efficient for cTNC5 than cTNC1. There was no cross-reactivity between anti-cTNC1 and cVIM and cFIBβ, though there was some inhibition by the CEP-1 peptide (17–70% inhibition) (figure 3A). In contrast, there was no cross-reactivity between anti-cTNC5 and CEP-1, while these antibodies showed limited cross-reactivity with cVIM and cFIBβ in one serum sample (inhibition by 58% and 50%, respectively) (figure 3B). Anti-cTNC antibody cross-reactivity with CEP-1, cVIM and cFIBβ. Sera, double-reactive with peptides cTNC1 or cTNC5 and CEP-1, cVIM or cFIBβ, respectively, were preincubated with increasing concentrations of the indicated peptides, and the IgG response to cTNC1 (A) and cTNC5 (B) was measured. CEP-1, citrullinated α-enolase peptide 1; cFib, citrullinated fibrinogen; cTNC, citrullinated tenascin-C; cVim, citrullinated vimentin. Because the FBG domain of tenascin-C exhibits some sequence homology with fibrinogen we also analysed whether anti-cTNC antibodies cross-react with epitopes on citrullinated peptides containing similar sequences of fibrinogen β chain (cFibβ281–296) and fibrinogen γ chain (cFibβ474–491, cFibγ409–426) (figure 4A, for peptide sequences see online supplementary table S2). From 17 sera reactive with cTNC1, 7 also reacted with cFibβ281–296 (figure 4B), from 19 sera reactive with cTNC5, 14 also reacted with cFibβ474–491, and 9 with cFibγ409–426 (figure 4C). To examine whether this dual positivity was due to true cross-reactivity, four samples that were double positive for cTNC and cFib peptide IgG were tested by inhibition experiments. No reduced reactivity to cFBG epitopes was observed when sera were preincubated with cFibβ and cFibγ peptides (figure 4D). Anti-cTNC antibody cross-reactivity with homologous fibrinogen peptides. (A) Multiple sequence alignment (Clustal Omega) of tenascin-C, fibrinogen β chain and fibrinogen γ chain. Arginines found citrullinated in vitro are highlighted in red, citrullinated arginines described as anticitrullinated protein antibody (ACPA) epitopes are underlined. (B and C) IgG response to cTNC1, cTNC5 and homologous cFib peptides was measured in sera positive for cTNC1 (B) or cTNC5 (C). (D) Sera, double-reactive to peptides cTNC1 or cTNC5 and the homologous cFib peptides were preincubated with increasing concentrations of the indicated peptides, and IgG response to cTNC1 and cTNC5 was measured. cFib, citrullinated fibrinogen; cTNC, citrullinated tenascin-C; HC, healthy controls; RA, rheumatoid arthritis. In 101 pre-RA sera (median 7 years before diagnosis), 18% of pre-RA sera were positive for anti-cTNC5 antibodies (figure 5A) compared with 2% of 326 sera from controls. No antibodies against cTNC1 were detected (data not shown). Therefore, because cTNC5 appeared to have better antigen specificity in our absorption experiments and a higher frequency of antibodies in pre-RA and established RA, further analysis focused on cTNC5. Anti-cTNC5 antibody response in rheumatoid arthritis (RA) and pre-RA sera. IgG response to cTNC5 and rTNC5 in serum samples from (A) 101 pre-RA individuals (pre-RA) and 326 controls, and (B) from 1985 patients with RA (RA) and 150 healthy controls (HC) from the Epidemiological Investigation of RA (EIRA) cohort. (C) IgG response to cTNC5 in the EIRA cohort in dAU when controlled for binding to arginine control peptide. dAU was calculated as described in Material and Methods. (D) IgG response to cTNC5 and rTNC5 in 287 serum samples from patients with RA (RA) and 330 serum samples from patients with osteoarthritis (OA) from a US cohort. The red line indicates the mean. Blue dotted lines indicate cut-off for positivity. Mann-Whitney U test was used to calculate p values for differences between groups (ns=no significant difference, *p<0.05, ****p<0.001). AU, arbitrary units; cTNC, citrullinated tenascin-C.
We confirmed the moderate-to-high diagnostic sensitivity of cTNC5 (51%) in an independent US cohort of 287 sera from patients with RA and 330 sera from OA disease controls (figure 5D). In this cohort the binding to rTNC5 was not increased compared with OA. Anti-cTNC5 reactivity was significantly higher in CCP2-positive patients compared with CCP2-negative patients in RA (figure 6A,B) and pre-RA samples (figure 6C). Anti-cTNC5 antibody largely overlapped with other ACPA (figure 6D,E, see online supplementary figure S3) in the RA and pre-RA cohorts. However in the EIRA cohort 5.4% of the serum samples exclusively reacted with the cTNC5 peptide alone. In the anti-CCP2 negative samples 4.9% reacted with cTN5. Anti-cTNC antibody levels correlate with cyclic-citrullinated peptide (CCP2) levels. IgG response to cTNC5 in (A) CCP2-positive (CCP2+, n=1255) and CCP2-negative (CCP2−, n=730) sera of patients with rheumatoid arthritis (RA) of the Epidemiological Investigation of RA (EIRA) cohort, (B) CCP2-positive (n=240) and CCP2-negative (n=47) sera of patients with RA of the US cohort and (C) in CCP2-positive (n=27) and CCP2-negative (n=74) sera of pre-RA individuals. (D and E) Heat maps showing the presence (blue) or absence (red) of an IgG antibody response to anticitrullinated protein antibody (ACPA) epitopes in RA sera from the EIRA cohort (D) or pre-RA sera (E). cTNC, citrullinated tenascin-C; RA, rheumatoid arthritis. In EIRA cTNC5-positive RA was associated with smoking (OR 1.65 vs 1.26) and HLA-DRB1 shared epitopes (OR 4.98 vs 1.68), but not with PTPN22 (OR 1.77 vs 1.44) when compared with the cTNC5-positive/CCP2-negative RA subset (see online supplementary table S3). We also analysed whether cTNC5 antibodies are associated with specific HLA-DRB1 epitopes and found that cTNC5 antibodies did not associate with DRB1*10 alleles, but with HLA-DRB1*01 and DRB1*04 alleles (see online supplementary table S4). Antibodies against cTNC5 negatively associated with HLA-DR13 (see online supplementary table S5). In the US cohort, cTNC5 antibody positivity was significantly associated with disease activity (DAS 28-CRP), but did not associate with other analysed clinical parameters (disease duration, swollen and tender joints, sharp score and erosion score) (see online supplementary table S6). In this study, we describe a novel citrullinated peptide from the FBG domain of tenascin-C. The citrullinated residues can be generated by either PAD2 or PAD4, yielding epitopes that are recognised by antibodies in approximately one of every five individuals with preclinical RA and with a moderate-to-high diagnostic sensitivity in early and established disease. Inhibition assays and analysis of antibodies to other well characterised peptides indicate that anti-cTNC5 antibody status is independent of reactivity to other citrullinated peptides. Even though a large number of antigenic citrullinated peptides have been described as reactive with ACPA in previous reports, few have been examined with the stringent criteria used in this study. Therefore, our findings suggest that cTNC5 is a novel and independent addition to the relatively small number of citrullinated peptides which are genuinely targeted by ACPA, and which may have a role in clinical diagnosis and investigating pathogenesis in RA. The FBG domain of tenascin-C was citrullinated in vitro by PAD2 and PAD4. While these enzymes have different substrate specificities,37 both modified the same nine arginines in FBG to a similar degree. Lack of citrullination of five other arginines in FBG by any PAD reflects the specificity of this modification, likely due to hindered accessibility of these residues, or unfavourable neighbouring amino acids. Citrullinated arginines were located at five distinct sites within FBG, of which two, cTNC1 and cTNC5, were reactive with sera from patients with RA. However, antibodies to only one, cTNC5, were detected in sera of pre-RA cases. The different associations of cTNC1 and cTNC5 suggest that cTNC5 may be important in priming the ACPA response, whereas antibodies to cTNC1 may arise as a result of epitope spreading in more established disease. These data also reflect that the autoantibody response in RA is not citrulline-specific; instead it depends on the whole epitope around the modified residue including neighbouring amino acids and the three-dimensional structure.10 It is well documented that distinct ACPA responses to different citrullinated epitopes within one protein exist, as described for example for citrullinated α-enolase13 or citrullinated fibrinogen.38 The peptide sequence of cTNC5 is predicted to form a very distinct, exposed structure at the very C-terminus of tenascin-C, potentially rendering it more easily accessible to ACPA than cTNC1. In addition, four sites are citrullinated within TNC5, compared with only a single citrullinated site within cTNC1, which may also contribute to the higher frequency of cTNC5 ACPA observed. 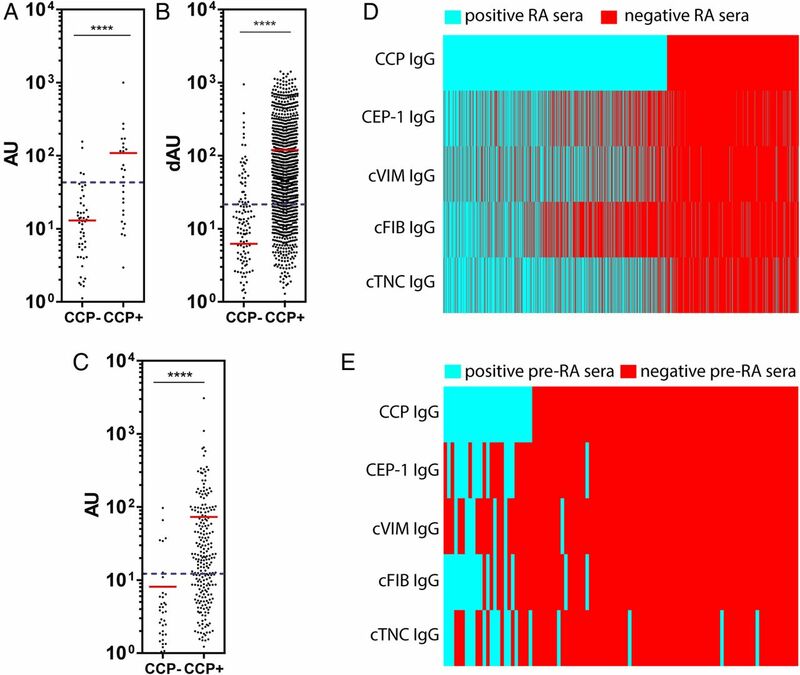 The frequency of anti-cTNC5 antibodies in the pre-RA cohort (18%) is comparable to antibody frequencies described for other ACPAs in the same cohort, including cFIBβ (18%) and CEP-1 (15%).33 Analysis of a large cohort of patients with early RA demonstrated moderate-to-high sensitivity of RA samples for cTNC5 (47%). This is the highest recorded sensitivity for any single antigenic peptide in this cohort, in this case compared with a 35–37% sensitivity for antibodies to each of the three other antigenic peptides.14 We also found reactivity to cTNC5 at a similar frequency (51%) in a second cohort of RA sera from US patients. ACPAs generally show limited cross-reactivity.14 ,39 In line with these reports, we showed that antibodies to cTNC exhibited little cross-reactivity with cFib, cVim and CEP-1, and are distinct from antibodies reacting with peptides from homologous regions in fibrinogen. cTNC5 ACPA-positive sera were mostly found within the anti-CCP2 antibody-positive RA population with cTNC5 antibody levels highest in the anti-CCP2 antibody positive subgroup, as described for other ACPA.14 Of the patients with RA 4.9% within the anti-CCP2 antibody-negative group were also anti-cTNC5 ACPA-positive, demonstrating that not all ACPA-positive patients can be detected by testing for CCP reactivity. Moreover, a subset of CCP-positive patients with RA was single-positive for cTNC5 antibodies (5.4%), revealing cTNC5 as a distinct ACPA fine specificity in RA sera and indicating that assaying this ACPA alone would be helpful in diagnosing patients that might otherwise be missed. Combined testing for several specific ACPAs has been shown to increase diagnostic sensitivity and specificity.40 Together these data suggest that the addition of cTNC5 to an assay combining multiple ACPAs, as well as analysis of anti-cTNC5 alone, might be beneficial approaches in diagnosing RA. HLA-DRB1 SE alleles are associated with ACPA-positive RA.41 We found a strong association of anti-cTNC5 antibodies with SE positivity, as has been described for antibodies to other citrullinated antigens, like CEP-1 and cVIM.14 ,15 cTNC5 antibodies mainly associated with HLA-DRB1 subtypes DRB1*04 as described for other ACPAs.15 ,39 HLA-DR13 alleles protect against ACPA-positive RA,42 and we show here that it is also protective against cTNC5-positive RA. However, we did not observe a statistical significant association of PTPN22, another genetic risk factor for RA,43 with anti-cTNC5-positive RA. Smoking is a well established environmental risk factor for ACPA-positive RA34 ,44 and here we describe a positive association of cTNC5-positive RA with smoking in the EIRA cohort, similarly as it has been described for antibodies against CEP-1 and cVIM.14 ,15 Smoking-induced inflammation, in the context of chronic obstructive pulmonary disease (COPD), is associated with enhanced citrullination and may contribute to the generation of ACPA.45 ,46 Interestingly, high tenascin-C expression was detected in lungs of patients with COPD compared with non-smokers.47 ,48 Another risk factor for RA, is periodontitis.49 Porphyromonas gingivalis is a major periodontal pathogen and possesses a unique bacterial PAD enzyme which citrullinates bacterial and endogenous host peptides.50 ,51 Tenascin-C is also expressed in periodontal tissue, and tenascin-C fragments were detected in gingival crevicular fluid of patients with periodontitis.52 Our results and these studies therefore reveal potential mechanisms for the generation of antigenic cTNC peptides in RA. The CCP-positive subset of patients with RA is linked with a more severe disease development and worse prognosis.5 ,7 ,8 However, no association of specific ACPAs with clinical parameters has been described so far.56 Here, we found that cTNC5 antibodies do not correlate with a number of clinical parameters, however, there was a significant association of cTNC5 antibodies with disease activity (DAS28-CRP), suggesting that cTNC5 antibodies may be a useful tool for predicting clinical outcome. In conclusion, we describe an immunodominant peptide from tenascin-C, which is distinct from the other major antigenic citrullinated peptides described to date, and at least equal if not superior in terms of diagnostic sensitivity and specificity when used as an antigen in ELISA. Furthermore, previous demonstrations of the proinflammatory effects of tenascin-C and its detection at the site of inflammation suggest that immune responses to the FBG domain may be important in the aetiology and pathogenesis of RA. The authors thank Lorena Zuliani-Alvarez for assistance with Circular Dichroism Spectrometry, Nastya Kharlamova and Lena Israelsson for help with setting up anti-cTNC ELISA, and Johan Rönnelid for help with ELISA data analysis. The authors also thank the investigators and study participants from all analysed cohorts.
. Smoking Affects Immune Response to Citrullinated Autoantigens Before Clinical Onset of Rheumatoid Arthritis in a Southern European Cohort [abstract]. Rheumatology (Oxford) 2014;53:i36. KL and KSM are joint last authors. Contributors KSM and PJV had full access to all of the data in the study and take responsibility for the integrity of the data and the accuracy of the data analysis. Study concept and design: KSM, PJV and AS; KL had main responsibility for the EIRA case control study. Acquisition of data: RF performed MS analyses of citrullinated samples and provided mass spectra, XJ performed statistical analysis on the EIRA cohort (association analysis) and provided tables, HRS performed statistical analysis on the US cohort and provided tables, AS performed all other experiments. Analysis and interpretation of data: AS, KSM, PJV, KL, XJ, A-MQ, TRM, JBP, RF and BMK. Manuscript preparation: AS, KSM and PJV. All authors have read and approved the final manuscript. Funding This work was supported by grants from Arthritis Research UK, the Kennedy Trust for Rheumatology Research and BT CURE. Competing interests The data in this manuscript are the subject of a patent filing. KSM is a Board Member of, and consultant to, Nascient.